Full length faceless female ballet dancer wearing white peasant blouse, gathered at neck and full sleeves gathered to wrist, with shaped dark brown bodice the top edge banded with pale yellow green set with small dark brown staf flowers. The knee-length skirt is dark chalky blue with a bold band in dull pale green decorated with flowers and foliage, over which is an apron, the centre of a fine white lattice, and to half way down either side a grey band overlaid from the waist to thigh with graduated bands of pale yellow green set with small dark brown star flowers. The peasant cap is banded across the head with hanging bands in deep chalky blue. Pencil, watercolour and gouache. Annotated. The design is for a Peasant in La Petite Fadette, a ballet in two scenes adapted by Deryck Lynham from the book of the same name by George Sand, was choreographed by Molly Lake with costumes by Sylvia Green and scenery by Beryl Dean, and premiered by the Ballet Guild in 1942. 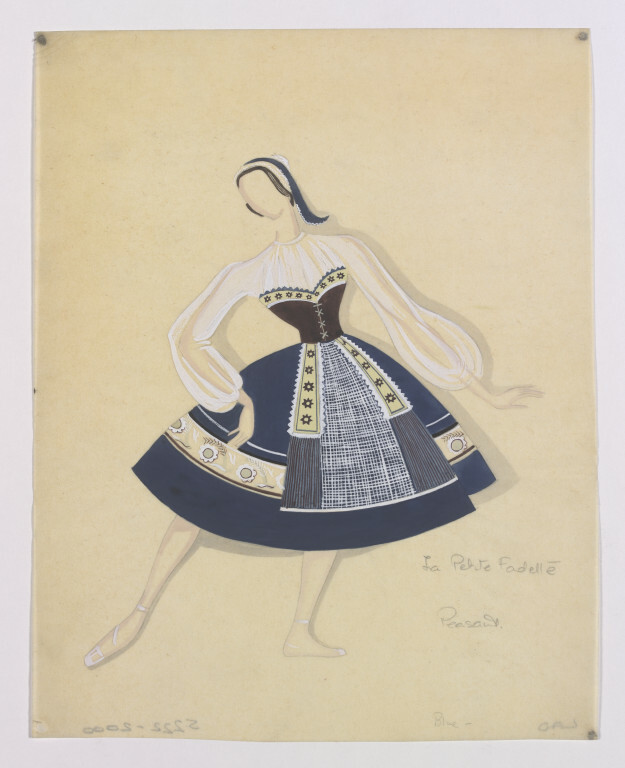 The design was originally part of the dance material collected by the Ballet Guild, which included books, programmes, pictures, souvenirs and material relating to its own productions, which was handed over to the London Archives of the Dance in 1945; Beaumont called this collection the 'founding nucleus' of the London Archives of the Dance. The Archives never achieved an independent home and the material stored with Beaumont came to the Theatre Museum as part of the Cyril Beaumont Bequest. 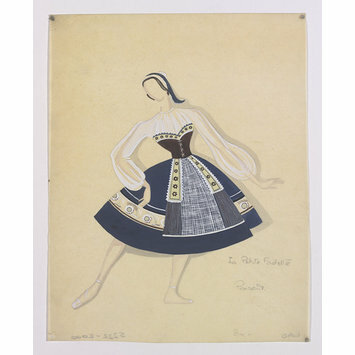 Costume design by Sylvia Green for a Peasant in Molly Lake's ballet La Petite Fadette, premiered by the Ballet Guild, 1942.